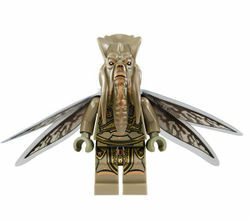 Poggle the Lesser is a minifigure released in 2013. He is also a playable character in the LEGO Star Wars III: The Clone Wars video game, and also features in cutscenes from LEGO Star Wars: The Video Game and LEGO Star Wars: The Complete Saga. In both other games, Poggle the Lesser only appears in the cutscenes during Episode II, during the intro of the Jedi Battle level. Poggle the Lesser appears alongside Count Dooku and Jango Fett, overseeing the beginning of the executions. However, apart from his unique head, Poggle has no particular details or printing showing. Poggle the Lesser was Archduke of Geonosis and a leading member of the Separatist Alliance. He played a vital role the beginning of the Clone Wars, as his droid factories produced the majority of the Separatists ground troops in the first battles. He was present in both Battles of Geonosis. He ultimately met his end along with all the other Separatist leaders when Darth Vader was sent to execute them. Poggle attempted to fight the Sith lord off with his cane, but was almost immediately sliced in half. In Star Wars Episode II: Attack of the Clones he is portrayed by Marton Csokas, who also plays Celeborn in The Lord of the Rings: The Return of the King. Facts about "Poggle the Lesser"
This page was last edited on 12 January 2016, at 23:38.